Eating in Santa Catalina is relaxed and affordable. Most eating establishments in this part of Panama are open air facilities. The food is homemade and very good. Santa Catalina offers a surprising variety of food both in type and ethnicity. Options include Italian pastas, Argentinean steaks, Pizza and authentic Panamanian food. A few of the restaurants are located a long the paved main street of Santa Catalina, however most are along the dirt road to El Estero and the roads that branch off of it toward the sea. They are located either in the various surf camps and hostels or along the road to them. Few are open all day, instead having specific times for each meal. For breakfast, the most dependable choice is Vasquez at the corner next to the store. It is not the best, but usually open and works in a pinch. When they are open, the best value for a home cooked meal at a cost of about $1.00, is the Tropical Fruit stand on the main street. It is 1 block from Playa Santa Catalina. Either of these will also prepare a sandwich to take on day boat trips for visitors headed to Isla Coiba or other near by islands. Also check with Mike and Michelle at La Vida Buena to see if their American style café is open for breakfast and lunch. Most establishments open for dinner around 7:00 pm. In Santa Catalina, dinner is often a combination, evening meal and social event. Visitors gather to share experiences in the day’s surf, dive and fishing trips. One of the favorite spots is the Pizzeria Jamming shop where a very good brick oven pizza is shared over a local Panama or Atlas beer. Donde Viancka’s is the best choice for a locally owned restaurant offering high quality Panamanian meals and is one of the few open most of the day. The charming Viancka operates the open air eatery herself with the help of a pair of nice local ladies. 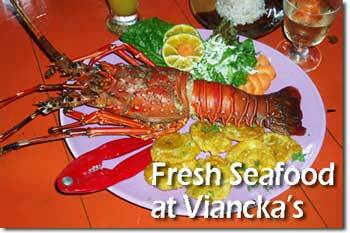 She offers local seafood purchased fresh daily and other local dishes. It is a great place to sit and spend a lazy afternoon as locals and visitors make their way up and down the adjacent road. 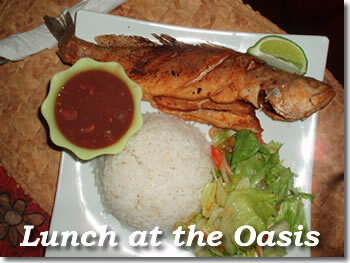 Other popular spots are Los Pibes and the Oasis Surf Resort restaurant. Both are east of town. Los Pibes is down the road to Playa Estero and up one of the side roads. The turn is well marked. It is an Argentinean owned restaurant which offers steaks and an excellent burger. The Oasis is located at the end of the main dirt road and across the river that creates Playa El Estero. At the Oasis, Italian brother and sister David and Sylvia oversee the creation of authentic pasta dishes.